My last suggestion for how to use Weight Watchers new cheeses (see previous posts here) is in a yummy salads. Do you ever come up with different salad combos? My husband thinks I'm hilarious for sometimes putting everything but the kitchen sink in them, but salads are great place to put in some power veggies and fun ingredients. Unless I am going with a particular recipe, the salads I make are usually different every time. 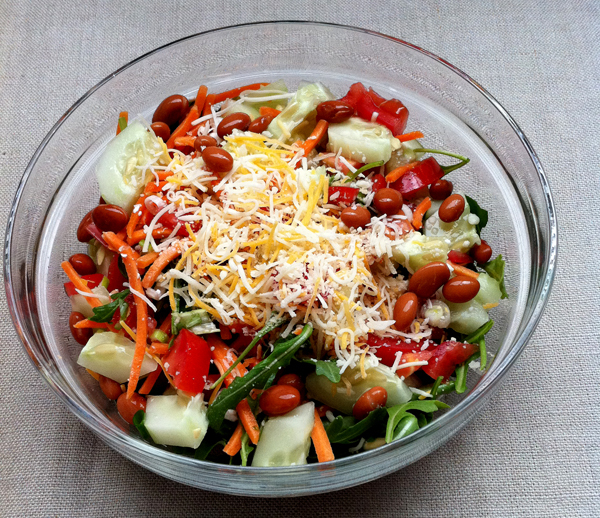 This one has cucumbers, pinto beans, tomatoes, carrots, arugula, baby spinach, and some Weight Watchers cheese. I like how you can add flavor with their cheese without the extra fat and calories and it is nice to throw a little more calcium in there too. What do you put in your salads? Hemp seeds! Adds a bit of crunch, and healthy omega fats. I also like throwing on sprouts of various types, and I buy bags of matchstick carrots to throw on top. Love to top my salads with broccoli slaw. It adds crunch and more green veggies. I mix it up a bit, but I love it when my salads have avocados and garbanzo beans. mmm. There is nothing like a good cobb salad. so much flavor and so satisfying and still so good for you. I am French and a huge fan of your blog ! lately i like adding hummus on top as a dressing... just make sure you mix it up well! Edemame! I eat edemame by the handful, in soups, in salads. I've had to look up what a healthy serving size of soy per day is, or else I'd eat nothing else!